Karolina is a Digital Health Scout at Roche Diabetes Care. She is responsible for identification and evaluation of digital health start-ups that work at the cutting edge of healthcare, and assessing their potential to drive significant improvements in patient outcomes and add value to Roche's diabetes care platform. Karolina has a wealth of experience in innovation and business development in healthcare and infrastructure. 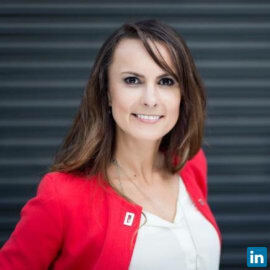 Prior to working at Roche Diabetes Care, Karolina held several positions at Siemens, including responsibility for development for new business models in Imaging & Therapy solutions, and leading the sales   of smart city solutions across South America and Scandinavia. She is a regular speaker at conferences on digital health and open innovation, and passionate about connecting good ideas and good people within the industry. Aside from her work at Roche, Karolina is involved in Health 2.0,  a member of Barcelona Global, helping to develop the city as a global hub for business talent, and acts as an adviser to the Innovation Forum, linking research projects from leading universities with corporates. Karolina has a Masters in psychology from the Universities of Hamburg and Warsaw, and an MBA from ESADE Business and Law School.